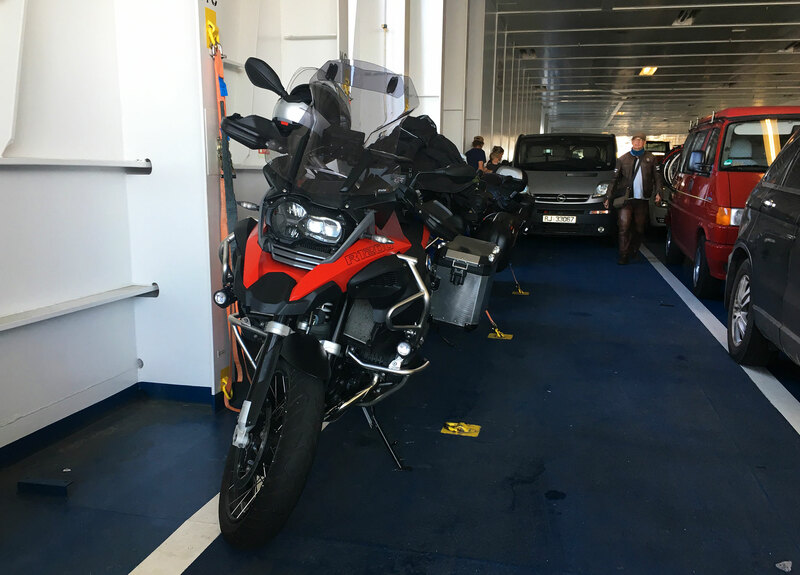 Mentioned in previous post, the Gedser – Rostock ferry trip is over in ca 45 minutes. That’s all it takes from Denmark to Germany. Motorcycle Adventure part III could commence. Well, in fairness I have to add some minutes to get on and off the ferry. So lets say maybe like 1 hour. Still, an Ideal solution for a motorist on two wheels. One gets a little break from riding, a possibility to relax. Lucky me, weather was excellent, temperature likewise, although walking around on a ferry when dressed in MC gear, is best on deck rather than inside. For coolness that is. Motorcycles have their own lane to the right, where the straps are. Found a cafe with not too heavy queue, on second deck, bought some food and drink. Then simply sat down on the deck munching while looking at people, and seagulls. Both equally interesting, well not quite. No sooner had I finished the coffee, made a pit stop, it was time to get down to the car deck and un-strap “the horse”. Germany next! Strapping of motorcycles is a DIY job. 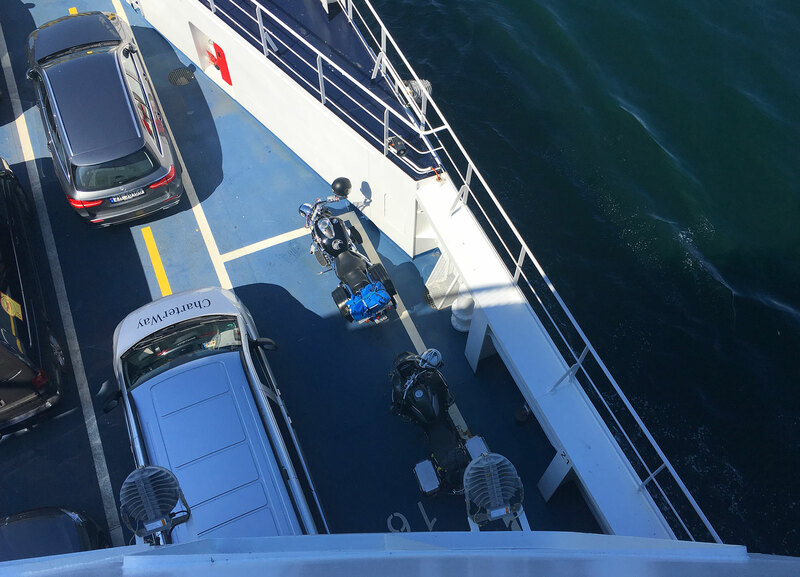 One strap per bike on short trip ferries. But no waves or rolling. wasn’t where I wanted to spend lots of time on this year. Rather the opposite! 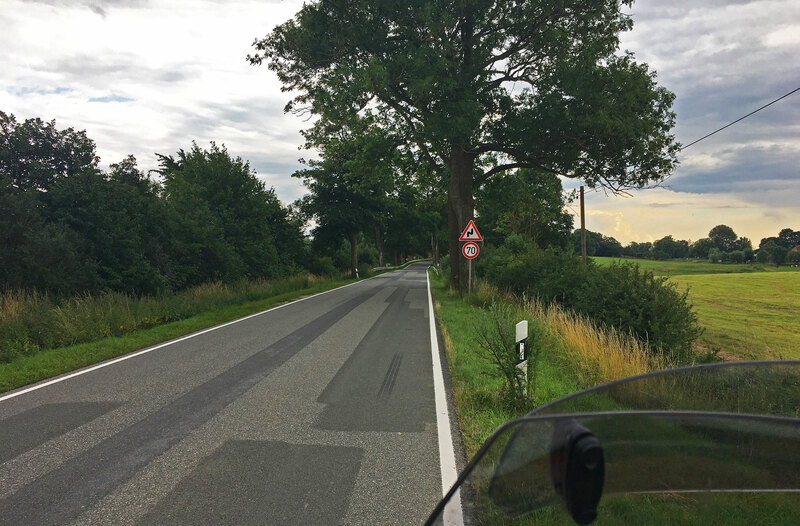 Had my share of riding up/down through Germany on freeways during the 2016 adventure. More than partially thanks to too little time and too much rain. It hit me, some miles “down the road”… what? Get off this freeway! 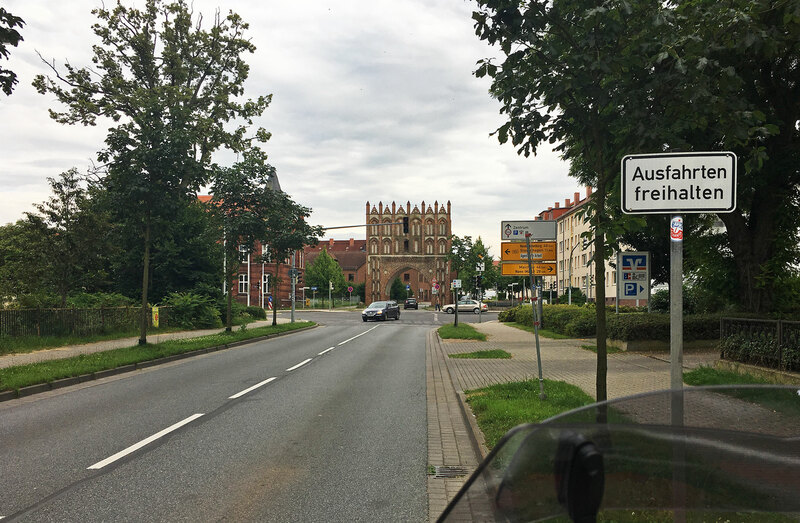 To escape denser populated areas I stayed on till past Rostock. Putting the city behind me, while heading in an eastern direction, I took off at an exit and let the GPS, configured for small, twisty roads, resume control. It did not take long before things started to get both interesting and more pleasant. Not that the landscape itself is mindbogglingly exciting, but one gets to see stuff, unlike when on the Autobahn. As the picture below illustrates. there was almost no cars on the road, and it stayed like that almost till first town. East German smallways. Little traffic, small towns or villages, pleasant and cool to ride! Mentioned earlier, the whole point about this adventure was, like last year, to wing it, to improvise. No plans, decide when in need of a decision. Steer in the direction of the front wheel literally. Stop when feeling like stopping. This form of traveling might not be for everyone, me, I love it. Using GPS POI (Point of Interest) to find hotels, sometimes maybe look up candidates on the net. It was getting late’ish, not that it mattered greatly, but I like having time to chill, to land. 10-11 hours is in my opinion a good days worth of travelling, especially when on a motorcycle. I can do longer hauls, have done longer hauls but then usually only if I have a definitive goal. This adventure wasn’t about any specific goal, the journey itself was the goal! I rode through several small towns but decided to stay on a little longer. It took me a little over half an hour past previous stop to get there. 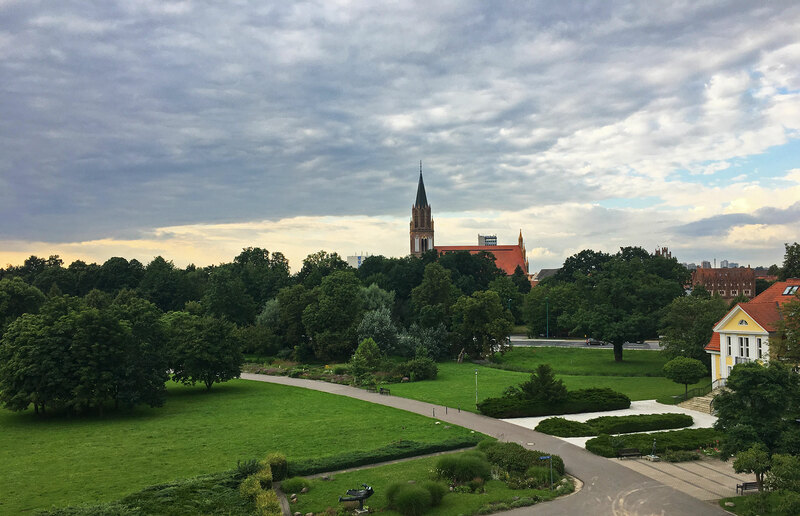 Neubrandenburg sounded good, by first glance and ride-thourgh had plenty of green lungs. Great! So picked out one hotel from POI list and rode there. Hmm, nope, didn’t feel right. Looked a bit deserted too. Then choose a second, the name ParkHotel sounded ok, Tripadvisor concurred. Good reviews always helps. The hotel was at the edge of a park, great location, no traffic, no noise, my room I had the below view. Nice little town Neubrandeburg. Lots of green lungs. There were no lounge or bar but a great restaurant just next door, in other words no need to go out and explore. Too late anyway. I chose the hotel because it wasn’t too central. 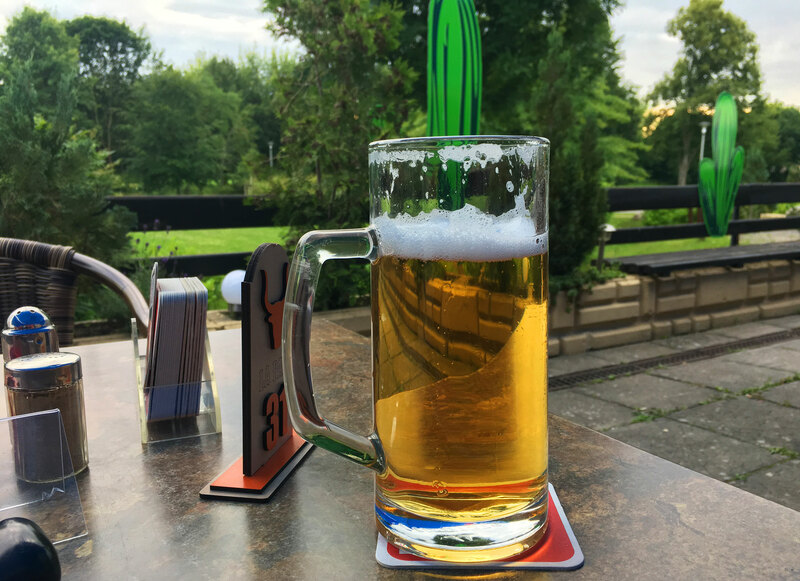 Now there was less reason to wander off, and…it was time for a well deserved beer! Time for a beer in Neubrandenburg. Don’t recall the name, but it was local and tasted good! If I ever journey through Neubrandenburg again I’ll probably consider the same hotel. The staff was helpful, friendly, and provided me with a garage for my motorcycle, free of charge. 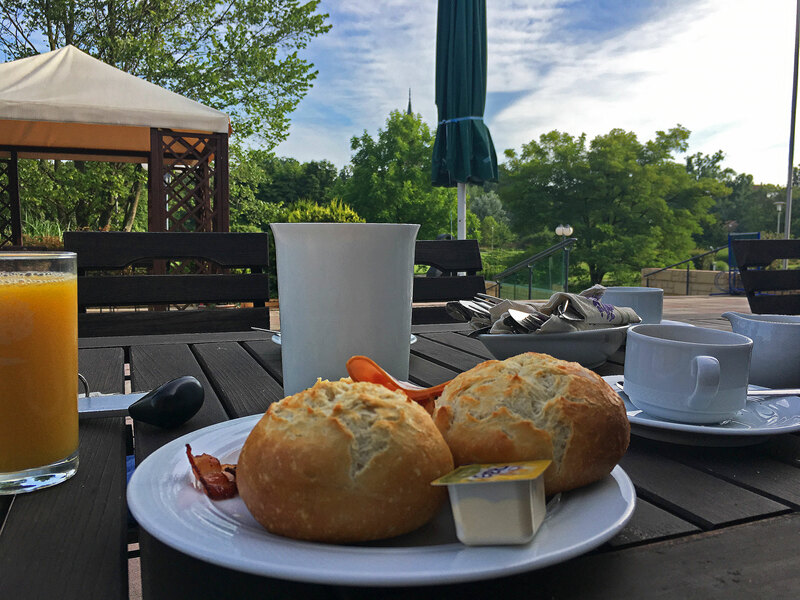 Next morning I had a good breakfast on the patio outside the hotel facing the park. A peaceful and pleasant start on the new day. A great start, batteries charged for the next adventure leg! This entry was posted in MC rides, trips & adventures and tagged Adventure, Life, MC related, MC riding, Nature, Vacation. Bookmark the permalink.